Nails Inc. is always looking for new things to add into the world of beauty, and their new Paint Can nail polish has us reeling. Designed just like a regular spray can of paint, this idea seems so simple but there is a clear level of innovation behind it. In order to use this product, you must also have Nails Inc.’s 2-in-1 base and top coat. So your first step will be to apply the base coat and let it dry, like usual, before grabbing the polish can. Make sure you have a designated spraying area that’s covered in something you don’t mind getting messy! Then you shake the can and spray the polish directly onto your nails (don’t worry about how much touches your skin!) from about 10-15 cm away. You can apply a top coat if you want it to last longer, but this isn’t necessary for the process. Once your nails are dry, you can just wash your hands in warm water and soap, or even using a face wipe. And then you’re done, and can enjoy your beautiful nails! Or, instead of applying the base coat to your naked nails, you can spray it over your already-painted nails for a quick and easy change. The best thing about Nails Inc.’s spray-on nail product is easily that it takes out the awkwardness of trying to polish your dominant hand! 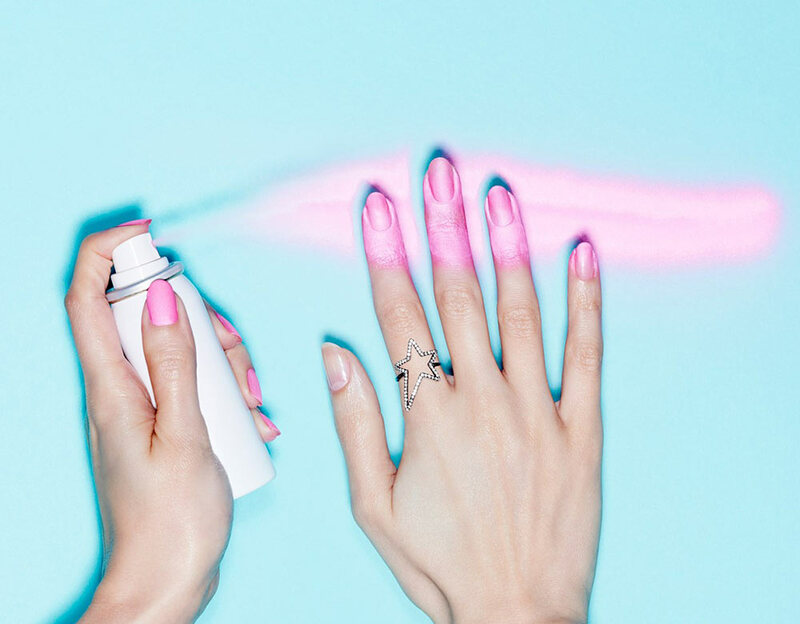 I personally have a tendency to make a mess of my dominant hand when I polish my nails, and this spray can would really help out with that. So I can’t wait to get my hands on it ” or, rather, get it on my hands! This product will be available beginning November 12, and can be purchased for ¬¨¬®¬¨¬£10 on the brand’s website, Sephora and Net-a-Porter. The product is available for preorder on their website. And, of course you’ll need the 2-in-1 base/top coat, which is ¬¨¬®¬¨¬£8. The only colors being offered are Hoxton Square (hot pink) and Shoreditch Lane (silver), but if the product goes over well, hopefully we’ll see new colors on the market soon. Tests have said the product is fun and easy, so once the burst of reviews comes back, we’re hoping to see great things come from the idea, with a lot more variety as time goes on.